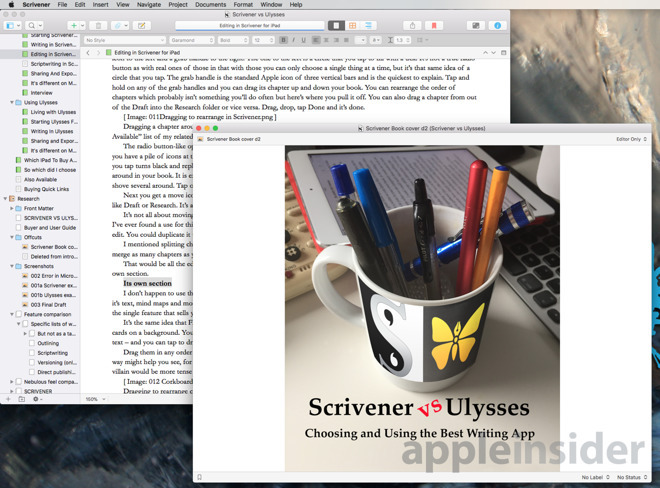 AppleInsider gets a published author to take a look at the Scrivener update, with new highlights including a much called-for rewrite of the app's Compile feature, and an interface modernization. New versions of writing software Scrivener can take a long time to arrive, but are significant, welcome, and very well done. Scrivener 3.0 for Mac is a major update that adds many new features and addresses one problem area with a complete rewrite. The app's Compile function, which is for taking your writing and sending it to ebooks, PDF, Word and so on, remains as powerful as it was but has been made radically simpler to use. Scrivener 3.0 for Mac is a writing environment: you write in it but you also use the tool to keep your research organized. Use it to prepare manuscripts for different places like publishers and websites. Use it to break up long documents into manageable pieces. It's not as bursting with writing features as Microsoft Word, but it is a powerful word processor that comes with exceptional tools for writers. Scrivener 3.0 is actually an exciting update: it adds to those tools and is a delight to use. The app has been overhauled to give it a more modern look. The overhaul is subtle, affecting mostly the icons, but it has the effect of making the previous version seem very old. It takes a while to get used to how many of the new icons are more than just buttons to click on. Now you can add a quick bookmark to, say, one of your chapters by dragging the title and dropping it onto the Bookmarks icon. Click that Bookmarks icon to open up a list of these bookmarks, though, and you can now also drag web pages into it. So much as you might with DevonTHINK or perhaps Evernote, you can grab websites and save them as research items. Scrivener 3.0 is replete with little touches that make adding and using research easier. You've always had one part which is your book or whatever document you're writing and another which is a research folder. It has always been that when you come to print out your document or email it to someone, they get your text and none of your research. That's still the case and you can fill your research section with PDFs, JPEGS, web pages and now also any file off your Mac. Later you can double-click on that file and Scrivener will open up whatever application is right for it. So if you've saved a bunch of PDFs, Scrivener will open Preview. If you've saved Word documents, it will open Word for you. One of the treats of Scrivener 3.0, however, is that you can preview most of these research files and also that you can preview them while you write. It's now fast to open, for instance, a PDF you've saved and have that on screen right next to where you're writing. This can be in separate windows or you can tile the one window into halves with your text in one side. You can also put another chapter into a new window or tile so that you can see both as you writing. Writing itself gets an overhaul with Styles. This is putting Scrivener more into Word's territory and means you can decide that all your chapter headings, for example are one size and font. More usefully, when you use Styles like this it means that later on you can change your mind and say that all chapter titles should be capitals, red and giant. One change to the style and all your chapter titles alter immediately. Scrivener has always been excellent for writing in. However, since not everyone uses Scrivener and surely every long document you write is going to be read by someone, you have had to export your work. You've had to change it into a format that non-Scrivener users can read. Most often that means saving it as Word. You could also save it as a PDF or go for something more complex like a ebook or paperback. As Scrivener encourages you to break your work up into smaller sections, the act of sending the document out starts with putting those pieces together. Scrivener calls this Compiling and it includes all the decisions about what format you want it to be in. Previously, Scrivener's Compile function has been extraordinarily powerful. Preposterously powerful. It's given you practically pixel-level control over how everything looks. Unfortunately, that power has come with hundreds of options. Each tiny option can make a big difference so on one project of ours, for instance, we ended up compiling over 60 times in order to get the result we wanted. We ended up taking screen grabs before each compile so that we could see which bit we'd just fiddled with. When Scrivener came out for the iPad in 2015, it included a much simpler Compile feature that simply did not have the power of the Mac or Windows version. Nobody really cared. It was powerful enough and so very much easier to use that it remains one of the iPad version's best features. Now the new Scrivener 3.0 for Mac's Compile feature is exactly as powerful as it used to be - but the complexity is hidden. It's still there if you want it but you have to dig more. Really all that's happened is that the developers have set up more templates for common uses but they've done it well. Those templates are front and center when you Compile and if you want to make changes, you can make as many as you need. It's just probably rare that you will want to. The new Compile feature is just one thing in a first-class update to an already first-class writing app but it's going to be a reason many people upgrade. If you are already a die-hard Scrivener fan, just go get Scrivener 3.0 right now. If you've never used it and so aren't sure how it will work with your writing, go get the 30-day free trial version first. Scrivener 3.0 for Mac does come with some limiting system requirements. Your Mac must be from 2009 or newer and it must be running High Sierra. One of the good things about Scrivener is how it works across multiple machines and platforms, though, so if you have an old white plastic MacBook then your Scrivener 3.0 licence will let you run the older Scrivener 2 on that. 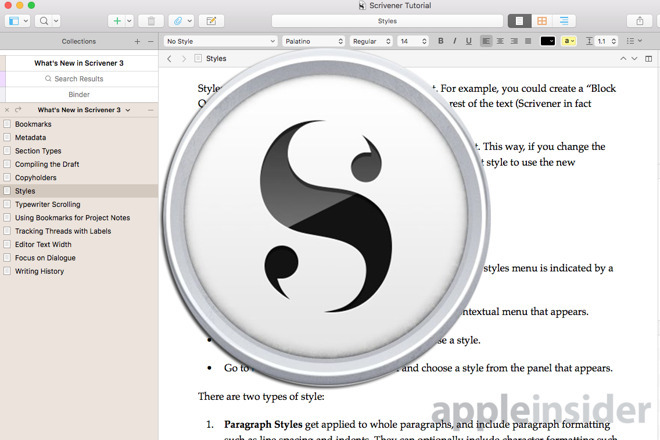 One more thing —like many writing apps, Scrivener comes with a tutorial. However, unlike most writing app tutorials, these are exceptionally well written. 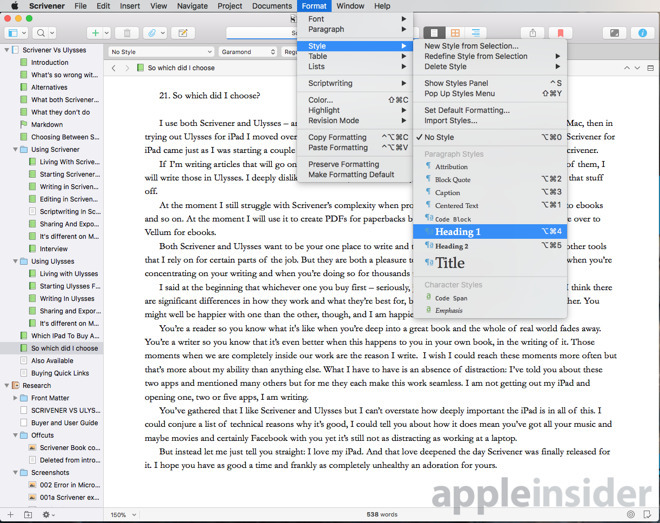 Scrivener 3.0 costs $45 and is currently available directly from the developer, Literature & Latte. It is expected to be on the Mac App Store soon for the same price. Existing Scrivener users can upgrade for $25 or for free if they bought on or after Aug. 20, 2017. There is also a Windows version of Scrivener which will get these new features but that update hasn't been released yet.